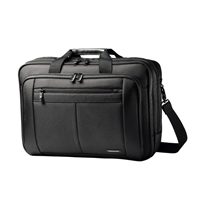 The black Samsonite Classic Business Perfect Fit Two Gusset Laptop Bag - 15.6" can go from the office to a business trip, to anywhere else you're headed. It's made from rugged 1680 denier ballistic fabric for durability. A padded compartment is designed to hold a laptop computer with a screen size of up to 15.6 inches. Since its checkpoint friendly, you can go through airport security without taking your laptop out of the case.